After having a negative experience many years ago with another chiropractor in Augusta, Johhnnie didn't think that a chiropractor could help him with his health conditions. Working as a bus driver for the senior housing facility Washington Commons in Evans, he kept hearing all the success stories that the seniors were experiencing from Dr. Huntsman's treatments at Georgia Clinic of Chiropractic. After encouragement from some of the seniors, Johnnie decided to make an appointment for himself. Just two weeks after his first treatment, he no longer experienced acid reflux, and hasn't looked back since. 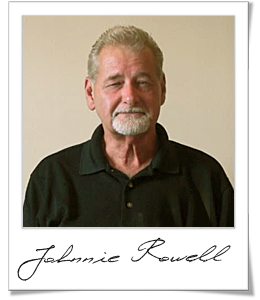 "My name is Johnnie Rowell and I’d like to share my experience with Dr. Huntsman. I was a bus driver with Washington Commons and some of his patients there and they were telling me what a magnificent job he was doing with them and I had a little back pain myself and I’ve been having it since I was really young. I got hit by a car when I was eight years old and it messed me up pretty bad and I don’t think over the years I had anything done to my back. One other time I went to the chiropractor but he didn’t do me any good so I just had never been back to another one. But I kept hearing good stories about Dr. Huntsman and when I came in with one of his patients I got to talking, and set up a schedule to come in, and I was kind of skeptical in coming in, because I had already been to a chiropractor before and it didn’t work. I was going to give it a try because I was in a lot of pain, and experienced unbelievable release from the first treatment with Dr. Huntsman. I only had three or four visits with him, and I’m telling you, it makes a world of a difference in my life. I couldn’t lift weights and as time went on I just learned to live with the pain. Since I met Dr. Huntsman I don’t have to live with it anymore. I was on medicine for acid reflux for over 12 years and I just thought I had to have it. When I came to see him he asked me if I’ve been having problems with acid reflux and I said yes. Two weeks after my first visit Dr. Huntsman, he asked me if I still had acid reflux, and then I thought to myself, ‘I haven’t taken my medicine’ and I still haven’t had to take my medicine to this day. So there is something in that nervous system that sometimes needs to be fixed. 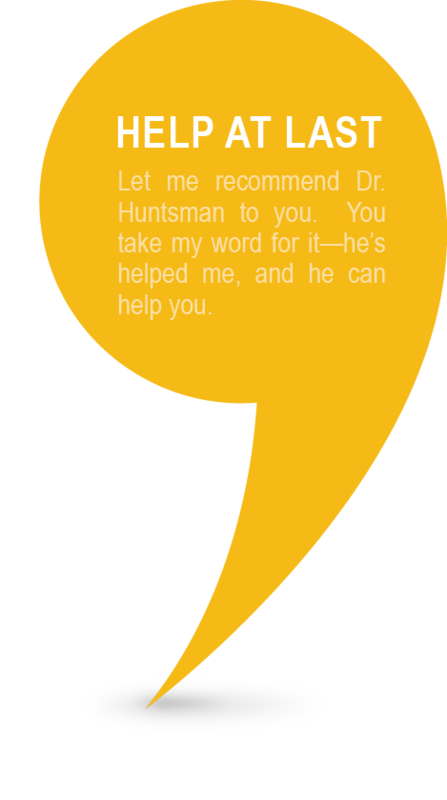 Let me recommend Dr. Huntsman to you. You take my word for it—he’s helped me, and he can help you."